Keywords play a very important part in searching of the websites, companies always try to get in the top searches so that they can generate more business out of the customers. One of the main factors that affect the business is the Long Tail Keywords. So, let us find out what exactly is the meaning of this Long Tail Keyword. These are a set of specified keywords phrased in a meaningful manner. In general, it has been observed that people who tend to buy or purchase thing on the internet / online market generally uses these Long Tail Keywords. By doing this they can easily specify their needs and get to the desired result that they are looking for. If you know the right trick to use them, then it may be very beneficial for you. Let us take an example of a ‘computer’. You need to purchase a computer online and simply you have entered ‘computer’ in the search bar of Google. When you do this you make one thing clear for the server that you are looking for a computer but the problem lies when the server is not aware of what is further related to the search of computer, so in return it gives all amount of data like computers, types of computers, history of computers, computers in modern world and many more. But when you need to purchase a computer then you can simply use the Long Term Keywords such as ‘Buy a dell computer model no. #####’ with this you will be landing up directly to the destination, now you will only be shown the different options to purchase the computer from different websites. So let us see that why one should get long tail keywords. Why to Getting Long Tail Keywords? For the companies who depend on upon their Online Market Business, they should be well versed and known with the management of the Long Tail Keywords, which is beneficial for the customers as well as for the Business growth of the company. Management of the Long Tail Keywords is simply to manage the easy and better communication in between your company’s business and the relative customers. Suppose that a person has typed in ‘furniture’ in the Google search bar, what are the practical chances of the customer landing up to your site and ending up in a sale?, but if the person has typed in ‘wooden classic antique furniture’ then he exactly mentioned his need as well your business has the solution then the possibilities are very high that the customer may land up in a sale. So hopefully, you have till now understood the role of long tail keywords for the success of your business, but after knowing all these benefits and importance of the long tail keyword the very first thing that strikes our minds is; how and where to get the long tail keywords. Now, we will be seeing some of the different ways of getting the long tails keywords from different software tools. The Google AutoComplete Tool is one of the most convenient tools to get the Long tail keywords. 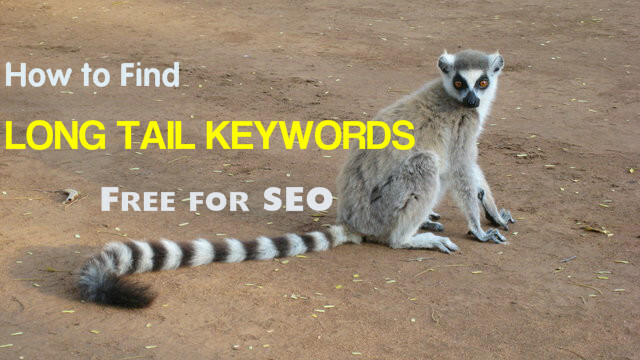 Let us see the steps to find out long tail keywords. Open the browser and go to the Google web page. Now as you see the Google search option you need to type in the keyword related to your search. For example, we will take ‘furniture’. Once you have typed in furniture than within no time you will see some option related to the keyword furniture. These are the long tail keywords which are proposed by Google itself. These long tail keywords are chosen by their popularity among all the users around the world. These long tail keywords are in reference to your given keyword, ‘Furniture’ will be given long tail keywords by Google as furniture in the US, furniture rates, furniture types, furniture for shopping. Etc. You just need to types a single word in the Google Search and you will get a list of long tail keywords and after that, you just need to click on the desired option provided by Google and then it will directly take you to your required search. Google Auto Suggest Tool is a customized tool for the default search of the Google. This tool is made by the Keyword Tool Dominator. This tool customizes the default feature of the Google Search and gives you a whole new experience of getting the long tail keywords. As mentioned in the first point for the Google Search option this tool takes over the Google Search opting and when you enter any of the keywords in the Search bar then it downloads all the possible long tail keywords in the form of a ‘.csv format ’. When this file is downloaded then you can simply open it and you will find out a long list of long tail keywords related to your search. You just need to select the appropriate one and then you will get your perfect search results from the Google Search option. This tool is recommended for all those who want to experience a whole new level of searching the long tail keywords and that to for free. For all those who are into business and especially in online business, this web app is the only thing that you have been missing since. Hit Tail is a Long tail keyword search app. It is a paid app and helps you to get increased ROI. When you are operating a Blog, e-commerce website, business blog or any business then the hit tail gives you a better ROI as compared to normal conditions. Better ROI towards your business generates better leads and hence you will get better business out of it. Hit Tail generates a very long list of different Long Tail Keywords in relation to the given specific keyword by you. Moreover, it suggests you the targets, which means that it will suggest you the most important and beneficial Long Term Keywords which will be best for the business. Hit Tail offers you a lot, as a result, is also attract more traffic towards your business portal and hence it is very helpful in generating higher business. You can get 2000 search results. It provides you the option of using the relative search tool. It gives you access to the search engine data by working on SEMRUSH. It provides you with options to save the long tail keyword lists. It provides you many details along with the long term keywords. Uber Suggest is an amazing freeware tool, yes it brings down all the long tail keyword search options at your doorstep for free. This keyword tool helps you to get various long tail keywords in reference to the keyword provided to it. It also lets you know the different details of the keyword such as the Keyword competition and the keyword search volume. It works the best in generating new and different ideas when you are writing some long tail keyword articles for any business. It gives you many more options for finding the long tail keywords. It can be termed as an all in one solution to the long tail keyword problem. It is a desktop software based version of the Longtail keyword search. This tool is not free and is to be paid for getting access to it. Yet it is a paid tool but still, it offers to take a glimpse of it features for whole 10 days as a free 10 days trial. In this 10 days trial, you will get to know all the features of the Long Tail Pro and it will make you purchase the full version for further use. In comparison to much top software’s for the long tail keyword search, it has shown significant results in its working and providing the fast and effective result to the given task of searching the long tail keywords. So these were some of the best long tail keyword tools for getting your desired keywords which will put you ahead in this competitive world. Having a customization tool for these kinds of searches is very important for the growth of the business. Once you get hold of these tools and you get to know the importance of the long tail keywords then you will probably grow well in your online business. Still one can also do some analysis work by comparing the keywords, using SEM Rush, using Google Analysis and much more, these all will definitely serve the purpose. Having the optimization done for the Long Tail Key Words always works for the growth of a business. Let us see some more reasons to get long tail keywords. Long Tail Keywords are helpful in getting top ranks. When you have certain optimization done on the long tail keyword management then it is quite possible that on the related searches you will land in the top 10 search results in the Google search option, and being in the top 10 is very helpful in generating good and helpful business for your company. It simply increases the visitors to your site and also the rate of communication also increases. When you have a larger set of keywords managed in long tail keywords then it is possible for the customers to reach your website as the search result places you n the top of the list. And human tendency works on ‘First come first get’ so being in the first few positions helps the customers to know your business and also generate business in the upcoming days. By setting up the optimization for long tail keywords you increase your mode of income from the online market, as mention in the above two points that it will help you in getting higher ranks as well as increased number of visitors, these two factors are directly related to the increase in the business of the company. For all those who need to be at the top of the charts and want to achieve greater heights in their business, they need to focus more on this small segment which can have large results. It is a value that is missed by many but those who keep these small points in mind and makes their business perfect are the once which sustain in the market for a longer time period. If you want to see the effects if the long tail keyword you can go with the free options and analysis of the keywords but when you know the potential and effect of the long tail keywords then it is strongly recommended going for the paid versions of the tools for the betterment of the business.